Experience the excitement and exhilaration of a real Canadian bear hunt. With us you'll trek into the Alberta wilderness for a six-day camping and hunting adventure. While there, you will enjoy all the savage beauty of a Canadian forest filled with moose, deer, grizzly and black bears, and even wolves. If you've always wanted to experience hunting bears in the wilderness, our hunters will be happy to be your guides. You'll experience our North-Central Alberta, Canada, hunting zone, where there is little local pressure on the bears since it is a non-baiting zone. It is also a two-bear area, and even better, choosing this region for a black bear hunt gives you a chance of finding a color phase bear, since some of the rare colorings can only be found farther north. We also include a wolf license in the price of your hunt. Our hunts are six days long, from Monday to Saturday. We also provide a hotel room in Barrhead the Sunday night before the hunt and the Saturday night after the hunt. This is for a coyote hunting only. $300 for 1,2 or 3 days. You are doing me a favor by shooting a few yotes! Absolutely no target shooting, no citing in guns, no shooting at anything other than a coyote in your crosshairs. This is for people who want the difficult task of hunting a coyote; they are much more clever than whitetail. *You must call coyote with a powerful speaker call...they don't visit food plots! Sorry....I had to say it. _____ I run 4-5 auto-corn feeders nearly year-round on 12-14 food plots so the turkey enjoy these advantages as well. When turkey season kicks in, the corn feeders are shut off by law, but the flocks regularly visit the alfalfa, clover, brassica remains, cereal oats, etc. 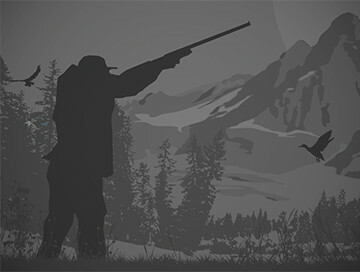 $500 per hunter for 3 day/night turkey hunts and $800 per hunter for 5 day/night bow hunts. $1,900 per hunter for gun hunts. GUN HUNTS AVAILABLE! At $500 per hunter on the turkeyhunts, and even if you book just for yourself, you won't be be mixed with "strangers" on the property or at the cabin. I don't cook for you or walk you to your stands. My work is done managing for the deer, I leave the hunting up to you. The cabin is free to use and is basic: gas lights, gas heat, gas cookstove, but no running water. It has an outhouse. Has bunkbeds, pullout coach, etc. There is a $49 per night motel 20 minutes away if needed. If anyone isn't feeling good or doesn't get around well, the cabin sits in the woods a little on a good clover food plot. You likely will get deer and turkey visitors! All the food plots we have for our trophy whitetail hunts are perfect for Kentucky turkey hunting! If you’re looking to shoot some great gobblers, at least come and tour our property. All the small clover and alfalfa food plots, it makes for an ideal place to spend Kentucky Spring turkey season. We have side by sides available if you want to make an appointment to swing by and see the property if you’re considering a Kentucky turkey hunt.